I blame it on the horrendous traffic even on weekends, sometimes I think it comes with age, but CS and I enjoy staycations now more and more. I get excited now seeing discounts and special offers in my email from Agoda that I normally treat as spam. Because after a stressful week at work, all we ever dream of is staying in a comfy bed and binge-watch on our favorite TV shows. A fairly new hotel that opened in 2015, B Hotel is situated in the quiet street in the rather busy Tomas Morato area. Guests are advised to park their cars in the hotel's basement for security purposes. From the parking, we took the lift to the ground level where the lobby is located. I'm loving the minimalist and industrial design of the lobby as it emphasize the hotel's furniture and modern decors. Check-in took no more than 5 minutes but the staff insisted that we take a seat first while she finish the process, a positive indication of how professional and courteous the staff of B Hotel are. I haven't been to Bellevue's 3 other properties but I'm hoping to visit Bellevue Bohol soon and hoping they extend the same level of hospitality as well. Waking up early for breakfast when on vacation is something CS and I usually forego so I can't really comment on the food that they serve in the Lobby Cafe. As the name suggests, buffet breakfast is open from 6am to 10am daily at the hotel lobby. You may also order room service or dine anytime of the day and order from their ala carte menu of international cuisine. B Hotel has a total of 111 well-designed rooms ranging from superior, 1-bedroom suite and 2-bedroom suite to cater to diverse needs and budgets of its guests. The lobby's unfinished theme is also extended to the rooms, sophisticated and minimalist, thus giving more space to move around. We booked a superior room that can accommodate a maximum of 2 adults and 2 kids. All rooms are air-conditioned, has complimentary wifi, has LED television with cable, a mini bar and a private toilet and bath. We loved the room's city view projected from the huge windows but happier that its on the higher floors to minimize the sound coming from the streets below. Apart from the glass walls, an interesting design that a lot of people find inconvenient was having the sink out of the bathroom. It took a while to get used to it but when you're engrossed on what you're watching, its actually favorable not missing out on anything, not even the commercial! If you ever feel the need to take a dip, you can go to the 7F where a 4-feet pool awaits. Proper swimwear is a must and there's no lifeguard on duty so always be mindful of the kids' safety. Have I enticed you enough? If yes, good news! 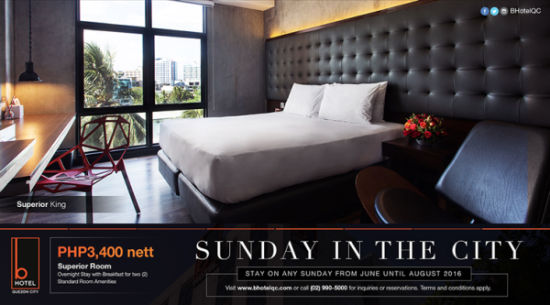 B Hotel offers a promotional rate of Php3,400 nett for a superior room inclusive of breakfast on a Sunday stay valid until August 2016. For stay falling on other days of the week, you may book thru Agoda for the most competitive rates available.